One of my favorite things to do is to take the pup for a ride to get ice cream. And you know what I realized? A lot of people go get ice cream by themselves. Not that there’s any shame in my single-lady-ice-cream-eating game, or anything. Sometimes a girl (or a business man) need ice cream. No big deal. While we’re not judging anybody, there’s also no shame in gobbling one of these at 9 am, right after getting home from the gym, possibly in the middle of photographing it, right? So, when my mom visited, we also made these cookies. The dough reminded us of Chocolate Crinkles. The cookies reminded us of chocolate graham crackers. These are a cocoa dream. They are delicious even in a couple days when they get a bit crunchier. Nobody will judge you for breaking one in half and dunking it your afternoon coffee. Whisk together the flour, cocoa powder, baking soda, and baking powder in a small bowl. Meanwhile, microwave 10 T butter until melted, about 1 minute. Remove from the microwave and stir in remaining 4 tablespoons butter until melted. In a large bowl, whisk together butter, brown sugar, vanilla, and salt until no lumps remain. Whisk in egg and yolk until smooth. Stir in flour mixture until just combined. Cover bowl with plastic wrap and chill for 30 minutes to an hour, or until dough is manageable and not sticky. Preheat oven to 350F and line baking sheets with parchment paper. Measure granulated sugar into a small bowl. Scoop 1/4 cup of dough using an ice cream scoop or measuring cup. 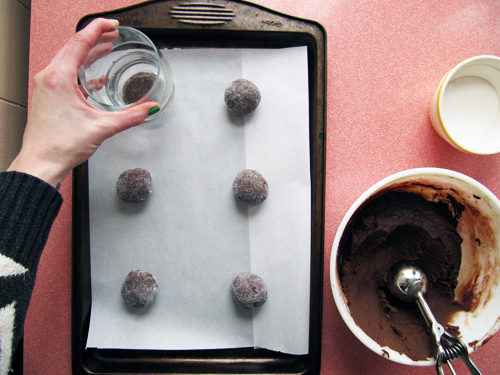 Roll into a ball, coat in granulated sugar and place on prepared baking sheets. Flatten cookie dough rounds with a glass until about 1/2-3/4 inch thick. Sprinkle with additional sugar. Bake for about 15 minutes or until slightly puffy and edges have set. Transfer to a wire rack to cool. Enjoy with milk or black coffee. I celebrated the snowy first day of spring with a sprinkle cone. I bet Sean would LOVE these cookies! 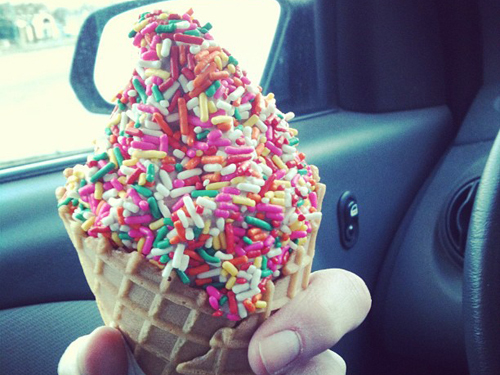 and that spring cone is rainbow sprinkled dream! Yeah he would! With chocolate ice cream sandwiched in there! I just pictured single ladies and business men sitting in their cars enjoying sprinkle cones by themselves. Sometimes we just have an ice cream emergency. Love those chocolate cookies!. 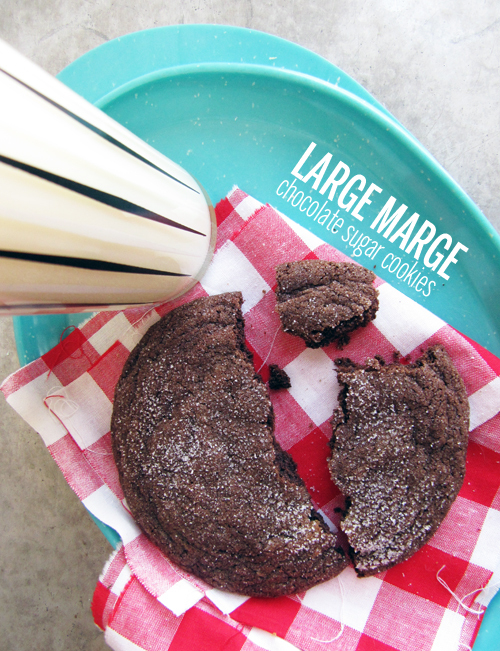 I’m so very glad you call them large Marge cookies. It’s one of my favorite parts of Pee Wee’s Big Adventure. But then again, I have so many favorite parts (like when he faints with snakes in his hands). 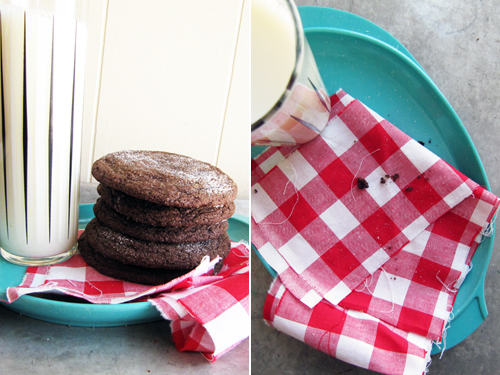 Love cookies (gonna make these today with my 3 year old) and LOVE Pee-Wee’s Big Adventure!…. and knitting…… and knitting……. Yay! Hope you guys love them. You are killing me! 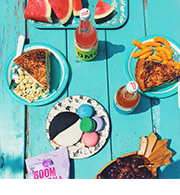 I would love those cookies (and that sprinkle cone?! Seriously?!!) I bake cookies in the middle of the night, so clearly I have no shame. I’m impressed with your nigh time baking! Hell yes. I made these AGAIN when I got home..for your Dad..for my Bible study group..and just for the fun of it..they are yum..and oh they smell good!! These look perfect for ice cream sandwiches Gurl! Also I would totally go grab some ice cream by myself. and just eat it in my warm car pretending it’s not windy outside. no shame at all. 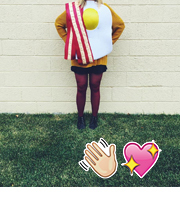 Next post: Let’s make cake this Easter.